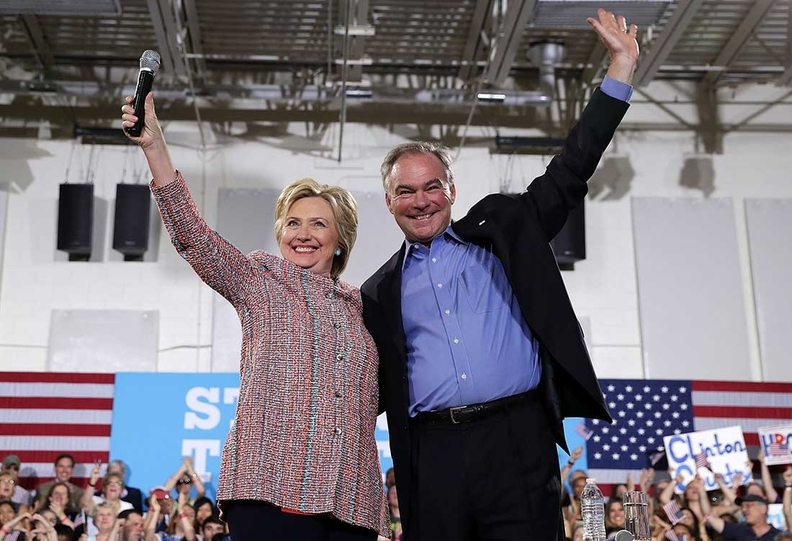 Kaine campaigns with Clinton in Virginia July 14. The man selected by presumptive Democratic presidential nominee Hillary Clinton as her vice presidential running mate is a strong ally of Clinton's in her push for improving the Affordable Care Act and expanding Medicaid to more states. Virginia Sen. Tim Kaine, whom Clinton named Friday as her running mate, has sponsored several bills to fix gaps and glitches in the ACA and to encourage more states to extend Medicaid to low-income adults. None have won Republican support and passed. He also has strongly backed Virginia Gov. Terry McAuliffe's unsuccessful efforts up to now to expand Medicaid in his own state. His former secretary of technology said Kaine was heavily involved as governor in implementing healthcare reforms on the state level, including implementing value-based payment, expanding transparency, and enhancing health information technology. "If you are interested in folks that are keenly aware of the very complex set of policy levers needed to make healthcare reform work, I can't think of a better person to be vice president than Tim Kaine,” Aneesh Chopra, who later became chief technology officer in the Obama administration, told Politico Pulse. This year, Sen. Kaine co-sponsored the States Achieve Medicaid Expansion Act, which contained President Barack Obama's proposal making states that choose to expand Medicaid after 2014 eligible for the same three years of 100% federal matching rates as states that expanded earlier under the ACA. The goal is to give the 19 hold-out states a greater financial incentive to accept the expansion. In 2014, Kaine co-sponsored the Family Coverage Act to fix the so-called family glitch in the ACA's premium subsidy system. The bill would clarify ACA rules so that individuals whose employers offer them health coverage that isn't affordable for their whole family could qualify for premium tax credits to help them cover the family premium. “The Affordable Care Act has given millions of families in Virginia and across the country access to quality, affordable healthcare, but serious fixes are still needed to ensure we fulfill this promise for all families,” he said in a 2014 news release. Kaine also co-sponsored a bill to increase the number of small businesses that qualify for a tax credit for covering their employees, and a measure to establish a new, ACA-compliant copper-tier of individual-market health plans with skimpier benefits and cheaper premiums. In addition, he co-sponsored a bill amending the ACA to include employers with 51 to 100 employees as large employers for purposes of health insurance markets, giving these mid-size firms greater flexibility in designing their employer health benefit plans. Kaine has expressed passionate support for expanding Medicaid to low-income people, citing his volunteer work at the free Remote Area Medical Clinic held annually in the rural southwest part of Virginia.